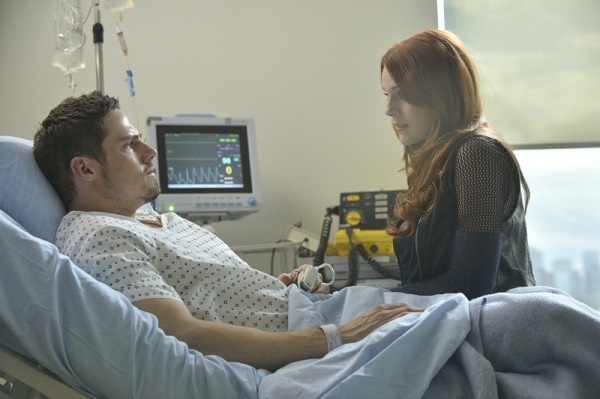 Poll: Are you ready for VinCat’s woes on Beauty and the Beast? Going into the winter break, things didn’t look good for Vincent and Catherine on Beauty and the Beast. Hold your breath, because they don’t look any better when the series resumes on Jan. 13. If the photo above doesn’t send Beasties everywhere into angry spasms, I don’t know what will. How dare Tori (Amber Skye Noyes) have her arm on Vincent’s (Jay Ryan) shoulder? If you recall, heading into the winter break on Beauty and the Beast, Cat (Kristin Kreuk) shot Vincent to keep him from harming her father, who had not only altered Vincent physiologically, but was using him as a one-man killing machine to knock off all the other beasts he knew about. Things are about as dire as they could be between the couple, even more so when you add in the pesky discovery of Tori, a born girly-beast whose own beastly characteristics only enhance the animal side of Vincent. 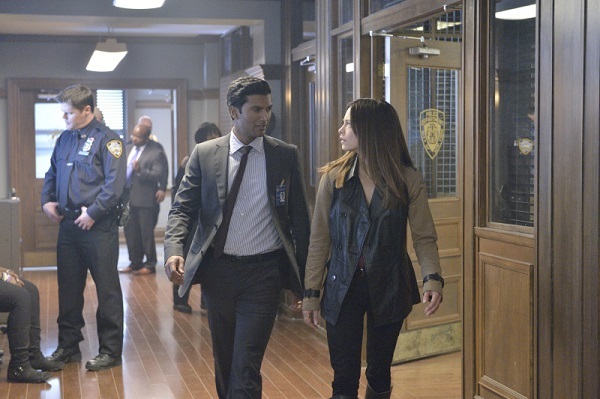 The repercussion of their attraction drove Cat closer to Gabe (Sendhil Ramamurthy). Come on, it’s not as if we expected Vincent to die, or be out of the action for any period of time, right? Let’s get some blood boiling by perusing a few photos. So Gabe’s going to try to get to Cat by helping her through the shooting of her FBI daddy? Of course he is! What red-blooded man wouldn’t want to get closer to Cat? You really can’t blame a guy for trying. J.T. (Austin Basis) is always getting himself into some sort of awkward trouble when he’s around Tess (Nina Lisandrello). It looks like they’re transporting an organ and she has to arrest him. TV Line reports he opens up to Tess and reveals a truth — could it be more about his crush on her? Here’s hoping! Did you notice in neither of the photos featured in this article that Vincent looks nearly as comfortable with Tori as she does with him? Could that mean something? There’s no doubt she needs him more than he needs her. It’s unfortunate that Vincent’s dalliances have been with red-haired girls, as it seems to denote a pattern. Let’s try to look beyond that to the bigger picture. If VinCat are together and without strife, what story is left to tell? So here’s the big question. Are you prepared to let the writers take you where the story needs to go to make the best of VinCat’s love? Are you a fair-weather fan who only watches to see the romance between Vincent and Cat, or do you trust that their current struggles will make them a stronger couple in the long run? Take the poll, and then hit the comments and share why you feel the way you do.